Have you ever wanted to see the "big picture" when you play music or learn a song? Would you like to comprehend the basic inner structure of Western music, allowing you to truly understand what it is you are playing or hearing? Do you want to play the piano but are intimidated by the 88 keys and the prospect of taking lessons from someone who teaches the standard repertoire: classical tunes and nothing else? If the answer to these questions is "yes," then congratulations--you've come to the right place. I can teach you what you really need to know. My book, The Marty Method—How to Play Piano and Understand Music— was written with a single purpose in mind: to explain music and how to play the piano, using graphics, carefully written text, and audio examples (CD included). By starting at the beginning of music: the fundamentals; and by using the piano as a teaching tool, The Marty Method will show you how music "works." By combining two interrelated subjects—piano technique and music fundamentals— you will learn how to play piano as you learn musical form and structure. If you are a beginner, this book is the perfect introduction to playing and understanding music. If you are a former piano student who was taught just two things—how to read music and play the standard classical repertoire—this book will expand your musical awareness to the extreme. Guitarists, singers, and other musicians will benefit from learning basic piano skills from The Marty Method. This book, along with the accompanying CD, uses an integrated approach that sets it apart from any other music instructional course. My successful career as a working musician led me to write The Marty Method, and a little background will give you a better idea of how and why the book was written. If you want to skip directly to a description of the book and its contents, click here. My fascination with popular music started when I was 14 years old. I began on the bass guitar because I wanted to get into a rock band as quickly as possible. Bass guitar was simple: four big strings, no chords to learn, and you only played one note at a time. You could play a very simple part and it was O.K. Whether a chord was C major, C minor, or C diminished, I simply played a 'C.' Once I learned where the notes were on the neck of the bass, I was set. My first band played songs by the Beatles, Creedence, Jimi Hendrix, the Doors—whoever was on the charts at the time. We would listen to the record over and over until we figured out the chords and the rhythms. This so-called "primitive" approach to learning pop music is the best way to start out, because you train your ear to pick out individual parts on the record. So I learned that the role of the bassist was to play the bottom note of each chord in a song. I later found out that this bottom note was called the "root" or "tonic" of the chord. The other notes in the chord were built upward from this bottom note. Songs used chords in patterns called chord progressions, so I decided that the more I knew about chords the more I would know about songs, and therefore, music. This led me to the piano. I already knew how to play one chord on the piano—C major. One afternoon I sat down at the family piano and learned all the major and minor chords. If I took what I already knew— a C major chord (C-E-G)—and moved each note one piano key to the right ("up" the keyboard), the end result was a C# major chord (C#-F-G#). Using this same approach with the C# major chord I moved each note one key higher and had a D major chord (D-F#-A) . I continued, one chord at a time, until I arrived at C major an octave higher. These were the major chords. There were twelve, and they each had a different shape that I could literally "see" on the keyboard. The minor chords were easy to figure out. If I lowered the middle note of a major chord one key to the left ("down" the keyboard) the result was a minor chord with the same letter name, i.e. lowering the middle note of a C major chord created a C minor chord. Now I knew 24 chords—every major and minor chord. This was getting interesting. This "street-level" approach to learning piano and musical structure is the essence of how I began to understand songs and is a core value in my teaching approach. Chords not only had a sound, but they also a "look," especially on the piano keyboard. Chords made shapes you could see. It seemed to me that understanding chords and how they worked in songs was the essence of understanding pop music, i.e. non-classical; the kind of music I liked. I found out that with your right hand you could play the three notes of the chord in any order as long as your left hand played the "root" of the chord, i.e. the letter name of the chord. This was something I figured out by "messing around on the piano." Never underestimate the power of just "messing around" on the piano! . I attended college and took music theory classes, and learned that these various note-orders were called chord inversions. Formal theory classes explained things about music that I had previously figured out by myself from...you guessed it, "messing around" on the piano. Slowly but surely, I was combining practical knowledge of music—playing pop music in a band—with more formal music training. This multiple approach to learning music gave me a great perspective on the world of both music "theory" and the more down-to-earth approach of listening to a record and figuring out the song. As I played in other bands, read music theory books, and took music classes at college. I developed a practical "working musician" understanding of how music was put together. I soon found out that by learning all the major scales (there were twelve), memorizing the major and minor chords (there were twelve of each), working out the best chord inversion for each chord, and getting a feel for the core rhythm of a tune (there were an infinite number of those! ), I could pretty much figure out a keyboard part to almost any pop song. I moved to Los Angeles and within two years was the keyboard and sax player for a rock band called the Motels. My early "street-level" approach to learning songs, combined with some formal music training at college and many years of playing in bands served me well. We made five albums, two of which earned gold record status (500,000 sold), and we had two Top Ten hits ("Only the Lonely," "Suddenly Last Summer"). I was pleased to discover that my knowledge of chords and my basic keyboard skills also helped me figure out sax solos. This core understanding of music fundamentals could be applied to any instrument. Cool. 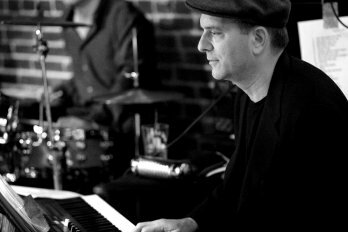 After a succesful nine-year career in the Motels I moved to Seattle where I now play, write and record music. I also began teaching private piano lessons. I looked at all the standard piano and music theory books but couldn't find any book that described pop music and piano the way I saw it. Out of frustration more than anything else I began creating my own teaching curriculum and musical examples for my students in the form of printed handouts. After a few lessons these handouts began adding up, and my students' three-ring binders soon resembled books in both size and content. I decided to organize, rewrite and integrate my teaching curriculum into a book to better present my approach. The result is The Marty Method. Many of my adult piano students are survivors of traditional "classical music" piano lessons from when they were younger. I soon realized how radical my teaching approach was, and is. These classically trained students could read music extremely well and play complex classical piano pieces beautifully. But I was amazed to discover that most of them knew absolutely nothing about chords, song structure and chord progressions! When I asked them to play a F minor chord they didn't know how. If I wrote out the chord symbols to a simple three-chord song such as "Yankee Doodle" or even "Happy Birthday," they didn't know where to start. If a song wasn't written out in the form of a printed music score, i.e. standard music notation, they couldn't play it. How could this be? I learned that traditional piano instruction focused strictly on one aspect of music— learning how to play the classical canon—while neglecting to provide any knowledge of how music—especially popular music— was constructed—how it "worked." This seemed like learning architecture by studying only the outside of a building, with no knowledge of the inside— the foundation, the steel girders and other unseen supportive structures. My approach was different. By teaching the basics of musical structure—scales, chords, rhythms, chord inversions—I was, in the words of one of my students, "lifting the blinders" from their eyes. Although I wasn't much of a sight reader or performer of classical music, I had a much better general understanding of popular music forms—rock, pop, jazz, folk, country, standards. This motivated and encouraged me to pass this knowledge on to people interested in the OVERALL structure of music and how this knowledge can be used when playing the piano. With The Marty Method, a piano (or electronic keyboard) and a quiet place to practice, you will learn how to play the piano. You will also learn how music works—and by this I mean you will be introduced to music basics such as scales, chords, intervals, chord progressions, how to understand rhythms, and much more. But equally important, I'll explain what you really need to know! As you learn more about piano technique, you'll be able to play what you have learned. That's why we learn piano technique at the same time we learn music "theory." We then learn how intervals are named, then we learn a simple trick to figure out four types of chords. And when I say a simple trick, I mean really simple. Music is primarily concerned with patterns, and musical structure is completely logical once you have learned the basics. 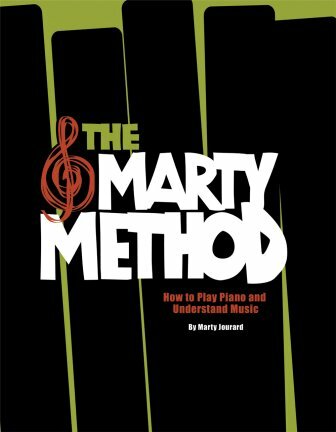 The Marty Method is a 156-page spiral-bound book designed to be used at the keyboard, and the binding allows it to lay flat when placed on the music stand of your piano. The dimensions are 8 1/2 x 11 inches , and the book weighs a hefty 1 1/4 lbs. It contains over 275 graphic illustrations, mostly piano keyboard graphics with dots or numbers indicating where to place your fingers on the keys, and in many cases indicating the exact fingers to use. In addition to the graphic illustrations there are many examples in music notation and six complete, easy-to-play songs in standard notation. Included with the book is a CD containing 34 musical examples taken from the text. But perhaps the most unique and useful aspect of the Marty Method is Chapter 17: The Art of Piano Rhythm. You won't find this in any other instruction book. In this chapter I explain one of the most challenging aspects of playing music, and of the piano in particular—rhythm! Rhythm (from the Greek word rhythmos, meaning measured motion) is the hidden ingredient that makes songs "move" and creates a sense of drive and forward momentum. Playing a separate rhythm with each hand can create music of tremendous appeal. I begin by demonstrating extremely simple rhythms, then slowly introduce more complex rhythms. Finally, I explain and play (on the accompanying CD) a section I'm extremely proud to introduce: "Thirteen Rhythms You Can't Live Without." These include such pop classics as the "Imagine" rhythm (John Lennon), Beatles rhythms ("Let It Be"), bossa nova, country waltz, a few Elton John classics, rhythms from the '50s such as Fats Domino and Jerry Lee Lewis, a great gospel piano pattern, and many more. This section of the book was developed from repeated requests from my students to explain "how to play like (Elton, Lennon, etc.)". Understanding music is one thing; explaining it clearly is another.I have taken extraordinary care to be clear in both what I am presenting and in how it is presented. The decision to use illustrations and graphics to explain concepts, combined with clearly written text, makes this book rich in content and easy to understand. I wanted this book to be informative and beautiful; when you hold a copy in your hands I'm sure you'll agree that it is both. For a better understanding of what subjects are covered here's the Table of Contents.. To see some samples of the actual book layout here is a PDF file version of the Table of Contents and also a PDF file of the first page of the book. You'll need a free download of Adobe Reader to view the PDF files. "This is a useful entry level book for anyone interested in knowing more about the piano and music." "You've written the book I was always planning to write someday! But thanks for doing the work for me. This is the best guide I've ever seen on how to grasp the basics of piano music, right away, in any style. Especially for the young rock keyboardist, this is deep, primary knowledge, and should be read over and over." In June 2005 the King County Library System ordered six copies of the Marty Method for their various branches. This is the second busiest library system in the U.S. Hooray for libraries! Hooray for the KCLS music buyer! "I'm completing chapter 8 of your book and find it is one of the best piano instruction manuals I have read. It is clearly written, provides excellent exercises and focuses on the most critical aspects of learning to play." "I've had your piano book for almost two weeks now and have not written back because I've been busy practicing! I enjoy playing through the exercises. They sound like music instead of dry technical exercises, so you get instant musical gratification. I have not been able to get a Hanon book yet, but will pick up one soon. I think your book is very well written, just like the Band book. It's as if you are sitting there giving the lessons. The lessons are easy to understand. I've checked out and purchased numerous books, but yours is the best so far." "Just to let you know that your book arrived safely and I'm happy with the book's quality. I read the first three chapters and found it well structured and very easy to understand...Although the first few chapters of your book cover all the basic stuff that I already know, it does give me a better understanding of how this basic knowledge fits together in the big picture of music structure, and this is probably the part that was missed when I learned piano as a child." "I love it! It is so helpful, it's opening a whole new world for me. Thank you so much. I can't believe how much I never knew about the basics. I actually look forward to sitting down and practicing scales... "
"To read your book is the best thing that could happen to people who want to learn to play piano from the very beginning, like in my case. Before taking classes I decided to study with The Marty Method. It really introduced me into musical knowledge because it has been written in a clear way, mixing funny comments inbetween, that it makes me lose fear to theory and encourages me to practise with enthusiasm. I have never found a book like this in my country. I truly believe that this is the result of the great experience and trajectory you have in the world of music. Thank you for sharing your knowledge!" If you are serious about learning how to play piano and want to finally understand how music "works," this book will show you how. Try it for 30 days, study the contents, play the exercises, listen to the accompanying CD, have fun with it. There is nothing "magic" about the Marty Method. This is not Piano for Dummies—I don't consider you a dummy—and it isn't Piano in a Flash. You can't learn anything of value in a "flash." You'll need to think, play, and absorb music, and think of it as a new language you are learning. I'm not teaching you the slang phrases of the language, I'm teaching you the grammar and the knowledge to truly understand music from the bottom up. I do promise to explain, clearly and in an easy-to-read writing style, how to play piano and understand music. If you aren't fully satisfied after 30 days with The Marty Method, you can return the book for a full refund minus shipping. Since publication, the Marty Method has been purchased by library systems in Washington and New Hampshire, shipped to music students in 20 states and to Canada, New Zealand, Hong Kong, and England. I've seen my teaching approach work for my students. I want to help you learn the piano, and learn how music works. The Marty Method can start you on your path as a real musician and piano player. Why not give it a try?